When I first looked at this book I thought that it might have been a bit of a fluff piece without a lot to offer. It really wasn’t that at all! She addressed some of the issues that I had with starting my practice. 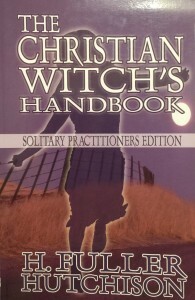 The author loosely details a way of incorporating the Christian aspects with Pagan aspects. She touches on just enough of each portion of Christian witchcraft to wet the pallet. Her writing style is easy to read and with a kind heart. For a beginner in their practice I would highly suggest this as it is clear and concise. For someone who has been in this practice for a while, I would probably not recommend it. I really wish this author would write another book expanding on her practice because she is such a nice writer, however I have not seen anything else by her…yet. Hopefully in the future she will surprise us with another installment.